A large number of roofs on homes in the Staffordshire area are suffering from moss, algae dirt and grime. 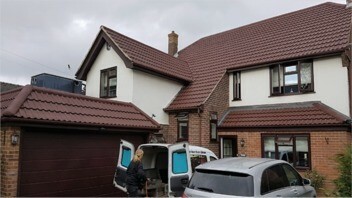 To combat this problem Smartseal™ has a number of professional roof cleaning contractors that cover Stafford, Burton on Trent, Stoke on Trent, Lichfield and Cannock who are trained to professionally clean, repair and protect your roof. After an enquiry is made one of our local registered roof cleaning contractors will contact you to provide you with a price for roof cleaning and roof moss removal. The climate in Staffordshire varies throughout the year; from hot summers to warm wet winters and most roofs, like any part of a home, have a habit of getting dirty. Damp roof tiles are very susceptible to the growth of moss and algae which can cause damage to a roof if left over a long period. What's more, most homeowners do not have the equipment or the desire to attempt roof cleaning. Therefore employing the skills of a professional roof cleaner is the best option when roof cleaning moss removal is required. Painting roof tiles with a high-quality roof coating like Climashield™ from Smartseal can give old roof tiles a total transformation. 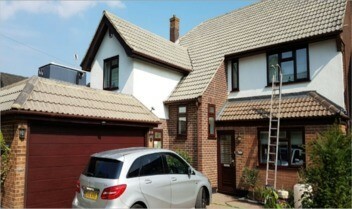 If roof tile painting is carried out by professionals it can make an old roof tile look like new again. Having a roof tile paint applied can restore the surface colour of concrete roof tiles giving the impression of a new roof. In addition, the roof tile paint will protect the roof tiles from the harmful effects of UV light and leave it water resistant. Moreover, Climashield™ roof coating is specially formulated to allow the roof tiles to 'breathe' and flex which helps to prevent them from cracking. Once you have reached an agreement with the contractor they can begin the 5 step roof cleaning process. After the initial risk assessment they will begin cleaning the tiles, removing any fungal growth and dirt from them; during this time all cracked tiles will be replaced and a biocide treatment will be applied to eradicate any remaining fungal spores trapped in the tiles. Following the cleaning process, Smartseal™ impregnating roof sealer or Climashield™ clear or coloured roof coating can be applied. These products are entirely optional but are recommended to any homeowner due to the 10-year guarantee and the number of benefits they provide. If you live in the Staffordshire area including Stafford, Stoke-on-Trent, Lichfield, Tamworth, Cannock, Lichfield and Newcastle under Lyme, and would like your roof cleaned and the moss removed please call 0800 849 9498 or fill in our online enquiry form now for your FREE quotation.